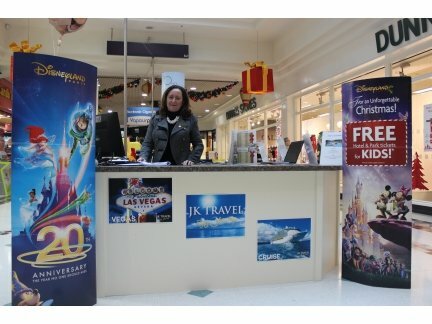 For all your travel and holiday needs, visit the JK Travel stand in the centre of the Bridge Centre. We specialise in Flights, Hotels, Long Haul, City Breaks, Cruises, Disney Packages, Ski Holidays, Weddings Abroad and much more. We offer Expert Travel Services and Advice Worldwide. Monday – Friday 10.00 a.m – 5.00 p.m.
Saturday 11.00 a.m – 4.00 p.m.